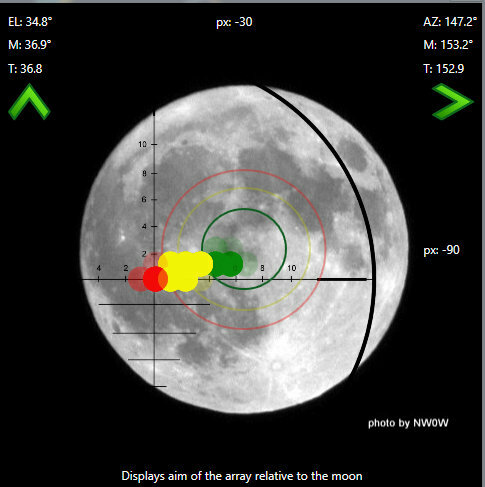 So I've been continuing to work on some simple Visual Tools to help me quickly check to see how well my array is aligned with a target (the moon in this case). I posted a video on this yesterday, and since then I've continued to do a bit more work on it. This bit was a little tricky to resolve how to handle. 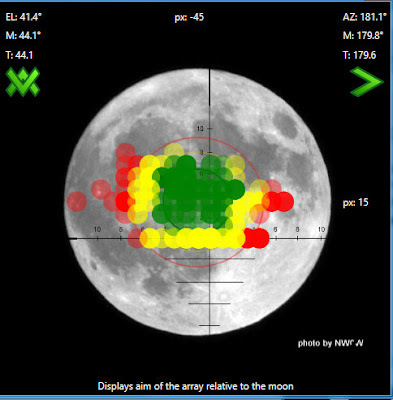 Basically I wanted to not only see at an instant in time (now) where the array IS, but I also wanted to know how well the entire system has been tracking for the last 15 minutes, and anything older than 15 minutes would just fade off the visual tool. So while this seems 'bling-y' there's a reasoning behind it. 1.) I want to see how well the array is currently aimed. 2.) I want to know if the wind's been blowing me around or if my tracking software is failing to maintain it's mechanical track with the moon. In other words, are the relays ON/OFF pulses timing properly (the software is controlling that so it's important to know if that bit is working (over time).